What is the Post Closing Trial Balance? The post closing trial balance is a list of all accounts and their balances after the closing entries have been journalized and posted to the ledger. In other words, the post closing trial balance is a list of accounts or permanent accounts that still have balances after the closing entries have been made. This accounts list is identical to the accounts presented on the balance sheet. This makes sense because all of the income statement accounts have been closed and no longer have a current balance. The purpose of preparing the post closing trial balance is verify that all temporary accounts have been closed properly and the total debits and credits in the accounting system equal after the closing entries have been made. An post closing trial balance is formatted the same as the other trial balances in the accounting cycle displaying in three columns: a column for account names, debits, and credits. Since only balance sheet accounts are listed on this trial balance, they are presented in balance sheet order starting with assets, liabilities, and ending with equity. As with the unadjusted and adjusted trial balances, both the debit and credit columns are calculated at the bottom of a trial balance. If these columns aren’t equal, the trial balance was prepared incorrectly or the closing entries weren’t transferred to the ledger accounts accurately. Posting accounts to the post closing trial balance follows the exact same procedures as preparing the other trial balances. Each account balance is transferred from the ledger accounts to the trial balance. All accounts with debit balances are listed on the left column and all accounts with credit balances are listed on the right column. The process is the same as the previous trial balances. Now the ledger accounts just have post closing entry totals. 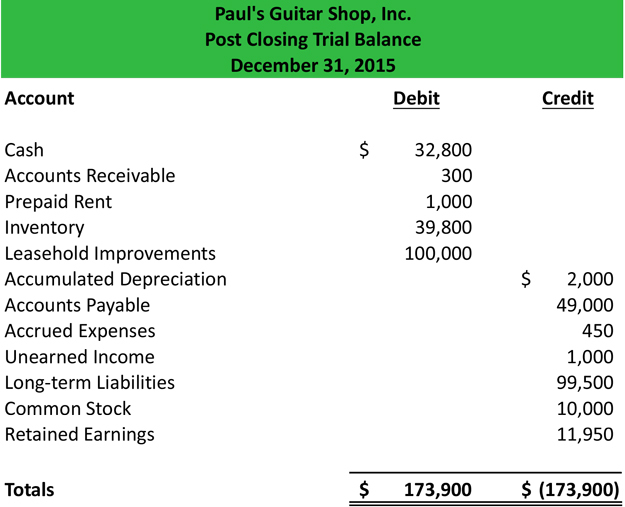 After Paul’s Guitar Shop posted its closing journal entries in the previous example, it can prepare this post closing trial balance. Notice that this trial balance looks almost exactly like the Paul’s balance sheet except in trial balance format. This is because only balance sheet accounts are have balances after closing entries have been made. Now that the post closing trial balance is prepared and checked for errors, Paul can start recording any necessary reversing entries before the start of the next accounting period. 1 What is the Post Closing Trial Balance?